To protect files and folders in your Windows 10, 8.1, 8, 7, Vista or XP computer, you need the best free file sync software to keep files up-to-date. AOMEI Backupper allows you to sync files regularly or manually from your computer to multiple locations. Speaking of file sync, first we need to know what backup is. Backup can store the important data so that we can restore the data while it’s broken. Well then, free file sync software is popular because it can synchronize many files or folders without any pay. It can backup the newly-created or updated files and folders from the source to the target directory. That is to say, file sync is going to keep two files or more stay the same. The files can be synchronized to the local disk or the different computers, and we called the single file synchronization or remote file synchronization. When doing file synchronization, it will scan the files of both folders and compare with the source directory to find the modified/added/deleted files, then, transmit the needed files or delete the needless files to stay the files the same. File sync is very convenient for people especially when you want to work at home after working time. I always heard some people usually working at home, which make them headache. Because the files they did at home will be different with the same files at company. Thus, they may update them respectively and that annoyed people a lot. However, if there is someway that one update and the other one update too, that would make things easier and bring a big convenient to people. We need file sync no time to delay. Considering the fees, we can choose the free software for file sync. There are many software can synchronize files. Compared with different software, we recommend using AOMEI Backupper Standard. The file sync feature of this software is very strong because it has powerful one-way sync function and it supports schedule sync. 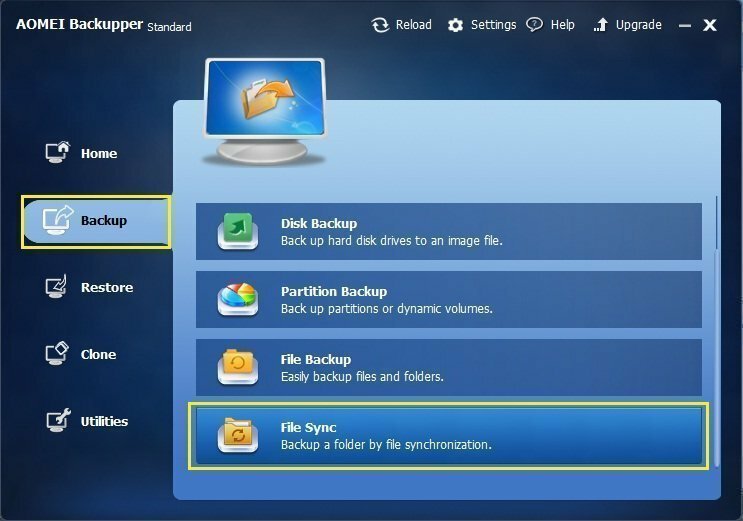 Besides, you can select wherever you want to store the folders, such as synchronize files to other computers through LAN or NAS. You can even synchronic files to the cloud storage drive indirectly. How to Synchronize File with AOMEI File Sync? The operation of AOMEI file sync is very simple. You only need two steps to finish it. ● Synchronize file or folder to CD/DVD/Blue-Ray is not allowed. ● It only supports one-way sync at present. Which means you can only synchronize files from the source directory to the target destination path. ● The software is free to use. Download and install and launch AOMEI Backupper Standard. Step1. Click "Backup" and slide the scrollbar to select "File Sync" like the following picture. Step2. 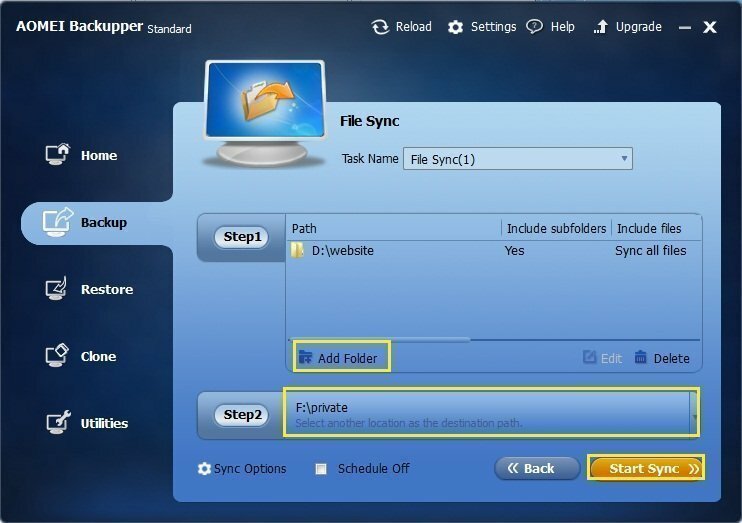 Add the folder at Step1 in the File Sync interface to choose the folder which you want to synchronize. Then, choose the target directory by clicking Step2. You can set up the specific requirements by clicking the "Sync Options", or set up schedule file sync by clicking "Scheduled Off" in the interface, too. Click the "Start Sync", it will synchronize the folder automatically. This free software can doing this only in two steps. It’s very simple and easy. If you have any question about it, you can visit FAQ about AOMEI File Sync.